The JabAERATOR is lightweight, sturdy and easy to use. Simply place the JabAERATOR over the ball mark or brown spot, step on the blue-cap, and lift. Its unique action flattens the depression and exposes holes to air, water and nutrients to regenerate the turf faster. The jabAERATOR addresses the perennial problem facing all golf greens; ball marks and brown spots. While playing golf, Felix Paz noticed the greens had many brown spots that resulted from golfers not repairing their ball marks and lawnmowers scalping the edges around them. Mr. Paz engineered a “patented tool” with a special type of pin called “spear” placed in the center of a series of other straight pins which flatten, lift and aerate the turf on the ball marks and brown spots. 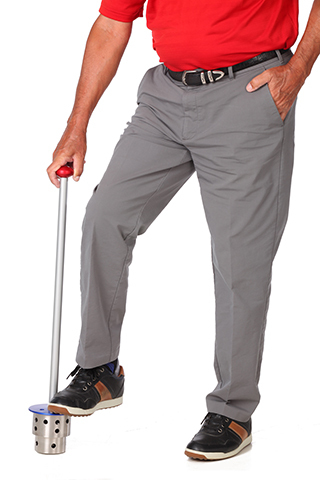 The jabAERATOR is foot-driven, compact, lightweight and easy to use from a standing position. With one foot-jab, the base flattens the edges of the ball marks or brown spots and 16 stainless-steel pins are driven into the ground. Upon release, the jabAERATOR automatically retracts the pins, lifts the depression and exposes holes to air, water and nutrients to regenerate the turf faster.